The team at Hennessey Performance has cooked up a new package for Chevrolet Camaro ZL1 owners who want to go from the street to the drag strip and runs 9s, and to battle Dodge’s newest high performance Challenger, HPE is calling this 1000 horsepower muscle car the Exorcist. 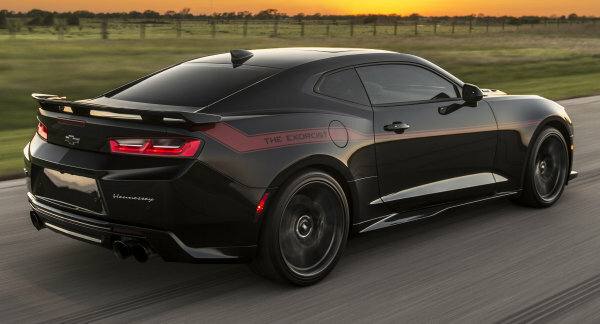 Dodge will soon unveiled their newest high performance supercharged Hellcat Challenger with an “evil” name, but the crew at Hennessey already has something to defeat the demons – the Chevrolet Camaro ZL1 Exorcist. This is a street legal package built around the 6th generation Camaro ZL1, with performance modifications which lift the output to 1000 horsepower and while pushing quarter mile times below the 10-second mark. That’s right – this Hennessey-built Camaro ZL1 is a street-friendly, 1000 horsepower muscle car that will run in the 9-second quarter mile range – making this package the easiest turnkey option for GM racers who want to challenge Dodge’s Hellcat cars. The new Chevrolet Camaro ZL1 is powered by General Motors’ supercharged LT4, which delivers 650 horsepower and 650lb-ft of torque to the rear wheels via a 6-speed manual transmission or a 10-speed automatic transmission. In stock form, this new Camaro ZL1 will put up a good with against the Dodge Hellcat Challenger, but with FCA preparing to roll out an even higher performance Challenger, the team at Hennessey Performance has planned ahead with their new Exorcist package. The heart of this new high performance Camaro ZL1 upgrade package is the engine, as Hennessey replaces the stock supercharger with a larger unit, a higher capacity intercooler system, ported factory LT4 cylinder heads, a new camshaft, long tube headers, and custom air intake system and a tune to bring it all together. The result is an increase of power (at the transmission, not the wheels) from 650 to 1000 horsepower and from 650lb-ft to 966lb-ft of torque. The 6-speed manual transmission is standard, but for $9,950, buyers can opt for the 10-speed transmission, which is modified to handle all of that power. Also, for $8,995, Camaro ZL1 Exorcist buyers can add the HPE drag package, which includes 20” rear wheels with Nitto 315/30/20 drag radial tires, a stronger driveshaft, a floor jack and a tool kit, allowing owners to swap to the drag radials at the track. When equipped with the drag package and the 10-speed automatic transmission, this Camaro will sprint from 0-60 in under 3 seconds while running through the quarter mile in the 9-second range. Best of all, you can order the Camaro ZL1 Exorcist through select Chevrolet dealerships, and even with the 1000 horsepower upgrade, Hennessey does include a 2-year, 24,000-mile warranty on the engine and transmission, while the other components of the vehicle remain covered under the factory warranty. There are only really two downsides to the 2017 Chevrolet Camaro ZL1 Exorcist – the limited production and the price. Hennessey only plans to build 100 examples of this 1,000hp package per year, so they are going to be hard to get. Also, the package costs $55,000 for the 1,000hp engine upgrade, plus the cost of the car and the costs mentioned above for the drag package and the upgraded automatic transmission. All said and done, the spec’d-out Camaro Exorcist has a price tag in the area of $137,000, but for those Chevrolet fans who want a crazy-quick Camaro with monster power and the ability to be driven every day – plus the exclusivity of the Hennessey Exorcist package – this is one impressive package. Price for the whole package? 6m and built automatic?